The High Court in Western Cape Province, South Africa, set 6 April as the deadline for evicting the last remaining foreigners from the Blue Waters safety camp, set up outside Cape Town after xenophobic attacks drove them from their homes in May 2008, but police have yet to carry out the eviction order. "I'll sleep outside, maybe on the beach," Vanel Sewika, originally from the Democratic republic of Congo (DRC), told IRIN as she washed clothes outside the tent supplied by the UN Refugee Agency (UNHCR), which she has shared with her husband and six children for almost two years. 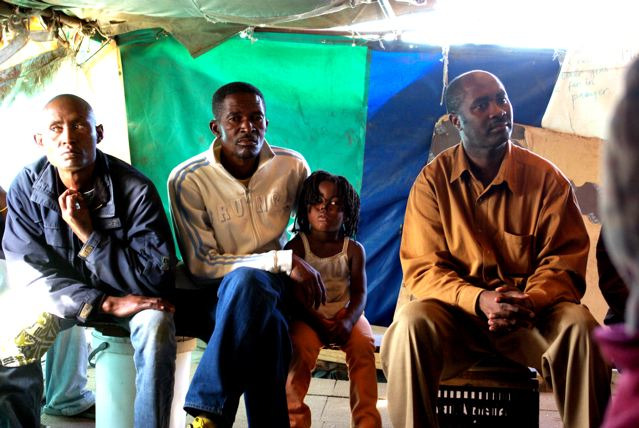 The city declared the site - a municipal campsite previously used for seaside holidays - closed in October 2008 but some 700 people stayed on, fearing a repeat of violence that left over 60 people dead across South Africa and over 20,000 displaced in the Western Cape. Various reintegration packages have been offered, including rental assistance, food and transportation, to entice people to move, but the city eventually resorted applying for eviction in March 2009. On 24 February the court ruled that all remaining individuals - around 350 - were to vacate Blue Waters by 31 March 2010. Sewika is among the 187 people still at Blue Waters, one of five Western Cape safety sites established to temporarily house the displaced, until a more permanent solution could be found. The court ordered the city to provide the displaced with skills training worth up to US$42,000, trauma counselling up to $14,000, or a once-off relocation payment of $140 per head; 34 families identified by UNHCR as vulnerable were to be relocated at the city's cost to Blikkiesdorp, a temporary relocation site in the already tense and troubled township of Delft, about 30km northeast of Cape Town. "Delft is very dangerous, but my country is also not safe," Sewika said. She wants to be resettled in a third country, as do most of the 187 people still at Blue Waters, who are mainly from troubled African states like DRC, Somalia, and Burundi. "We were given three options: reintegration to the communities, repatriation, or resettlement," said Manuel Mayele, a Congolese who worked as a hotel porter in Cape Town before the xenophobic attacks. "I'm asking the UN to give me a third country. For now, Blue Waters is the only place I feel safe." Patrick Male, the UNHCR's head of field office, urged the camp residents at a meeting held on the scheduled eviction day to face the reality of their situation. "As long as someone remains in the camp we will not review your [resettlement] case ... we are not going to do it as long as people are in this site. That is case closed." Male stressed the need to work together to find a permanent solution. He explained that the UN was not a government body, and could not work outside state law. "It is difficult for us to help you when you are not cooperating with the authorities," he said. He also pointed out the responsibilities of the individual, urging those present to read the articles of the Refugee Convention. "You have a part to play. Even in the fear that you legitimately have, you have a part to play to overcome that fear." The reluctance of those still at Blue Waters to leave the campsite, despite the patience of city officials wearing thin, is testament to the hostility they could face outside the camp - they have also forgone the city's offer of skills training, trauma counselling, and cash to help them reintegrate. "On the 23rd of May  I almost died," Sewika told IRIN, removing her headscarf to show the large scars across her scalp where her neighbours in Capricorn, a development on the outskirts of Cape Town, threw acid at her. "'This mama is makwerikweri [derogative term for a foreigner],' they said. This problem is not over - I think sometimes I should die," she said, staring out at the sea just a few hundred metres away. "I would take my children and put them in the water and die." Initial sympathy for the displaced has since largely turned into frustration, but conditions at Blue Waters are no holiday. Since the camp's official closure in October 2008, the city has limited its services to refuse removal, sanitation, water and security; all other support, such as the provision of food, ceased long ago. Fearing reintegration, and coming from countries to which repatriation could be equally dangerous, most in Blue Waters hold out hope for resettlement to a third country. However, as UNHCR's Male explained at the meeting, even for those who qualify, the paperwork can take a very long time. So they will have to move again, but few seem likely to go voluntarily. City Spokesman Pieter Cronje said the eviction was in the hands of the Sheriff of the High Court, and all repatriation and resettlement cases fell under the UNHCR. "The next thing will just be ejection without any money," Male said. "I don't want to be here, as UNHCR, and see the police coming to throw you out. But do you see us stopping them? I'm not a soldier. The only thing I have is the law."